Stories of idiosyncratic and demanding composers and bandleaders abound in mid-century jazz—of pioneers who pushed their musicians to new heights and in entirely new directions through seeming sheer force of will. Miles Davis’ name inevitably comes up in such discussions. Davis was “not a patient man,” jazz historian Dan Morgenstern remarks, “and I think he got impatient with himself just as he did with other people.” Jazz and other forms of music have been immeasurably enriched by that impatience. Other bop eccentrics—like John Coltrane—brought their own personality quirks and personal struggles to bear on their styles, pushing toward new insights and experiments that shaped the future of the music. Their peer Thelonious Monk, writes Candace Allen at The Guardian, “the jobbing musician who couldn’t, more than wouldn’t, conform to the conventions of the job," seemed the odd man out. He "spent most of his professional life struggling to support his family.” Monk's “misdiagnosed and ignorantly medicated bipolar condition” and his stubborn refusal to follow trends made it difficult for him to achieve the success he deserved. But it was Monk’s inability to do things any way but his way that made up the essence of his greatness—his insistence on “playing angular, spacious and ‘slow,’” his “daunting and mysterious” silences. A musical prodigy, Monk honed his piano chops in Baptist churches and New York rent parties before his residency as house pianist for Teddy Hill’s band at the famed Minton’s Playhouse in Harlem, where he helped usher in the “bebop revolution.” While he “charted a new course for modern music few were willing to follow,” notes All About Jazz, those who did learned a new way of playing, Monk’s way. What does that mean? 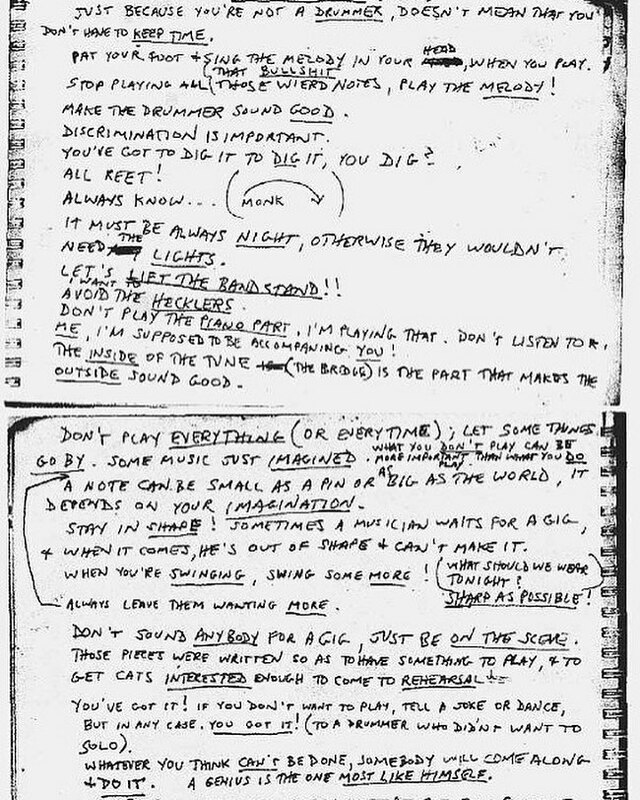 The list above, as transcribed by saxophonist Steve Lacy, lays it all out. “T. Monk’s Advice,” as it’s called, offers guidelines, pointers, and pointed commands. Some of these instructions relate directly to live performance (“don’t sound anybody for a gig, just be on the scene,” "avoid the hecklers"). Others get at the heart of Monk’s genius—his talent for creating space, both inside the arrangements and between the notes. Monk makes sure he’s the only one playing “weird notes,” demanding that musicians “play the melody!” “Don’t play the piano part,” he says, “I am playing that.” And he peppers the list with cryptic philosophical and social observations (“discrimination is important,” “always know,” “a genius is the one most like himself”). In the last item on the list (cut off in the image above), Monk veers sharply away from music with some humorous social commentary. It’s a move that’s typical Monk—both deeply serious and playful, entirely unexpected, and leaving us, as he instructs his musicians, “wanting more.” See a transcription of Monk's list of advice for musicians below. Words to live by even for us non-musicians.